How about a trip to the dark side...? 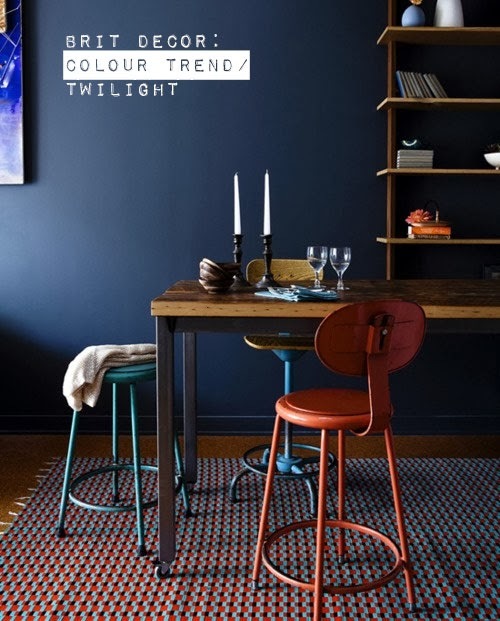 A new trend emerging for 2014 is the perfect antidote for bright whites and pale neutrals; the twilight palette serves up a sumptuous selection of rich textures and intense colours. But dark doesn't have to mean jet black, try incorporating deep blue navy or charcoals. 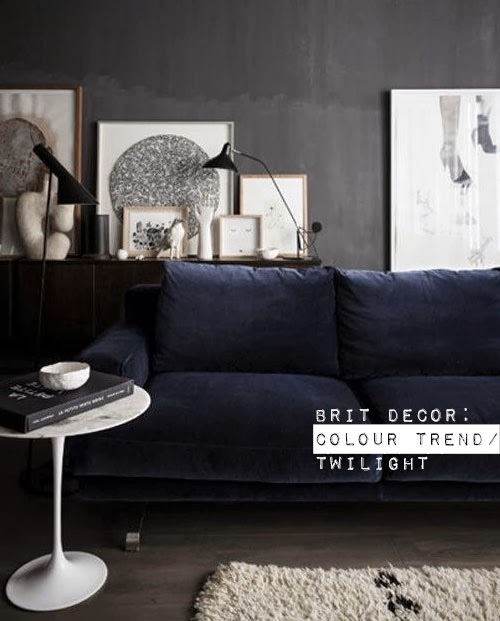 Deep blues can also be luxurious like the decadent velvet chesterfield sofa from Debenhams (no.6 above). Compliment this with silky soft cushions such as (no.7) from Etsy. Using a high gloss or eggshell paint will create a reflective finish and capture the light, bouncing it around the room. If you don't feel brave enough to go 'all-out' then pick out a single feature wall or a chimney breast and compliment with co-ordinating accent accessories and textiles. You can also shed some light onto this palette with lighter prints and artworks such as this beautiful seashell print (no.4) from Etsy. Throw some lighter hues into the mix to create flash points, like this Single turquoise stadium chair, £79 from Pedlars (no.1). 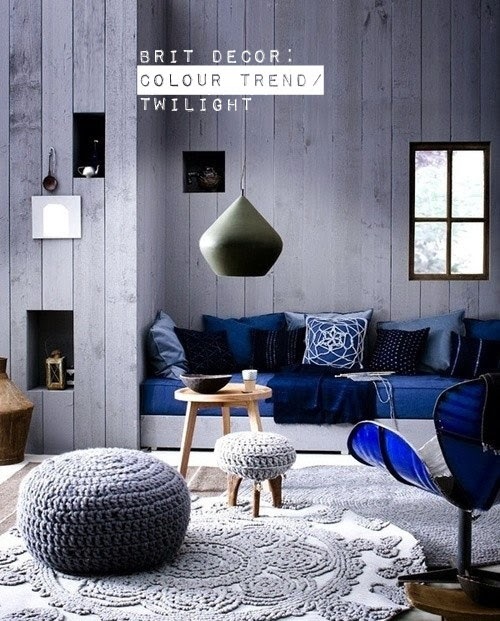 Another tip for offsetting a twilight colour scheme is to add one or more white walls to bring an element of freshness to the room - the contrast between light and dark also creates a feature. Darker shadowy colours can make a room look more cosy and inviting, wrapping the space around you like a comforting blanket. 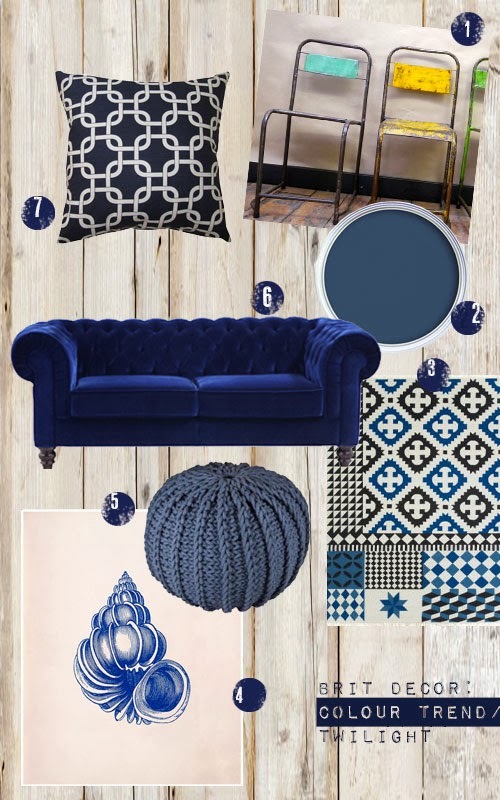 Try Graham & Brown's police box blue emulsion (no.2) for a sophisticated blue and match this with luxurious textiles such as this striking Gandia Blasco Palermo blue & black Kilim rug from Heals (no.3) or Abode's petrol blue knitted pouffe (no.5), with a strong emphasis on pattern and texture. Layering a darker scheme with multiple lighting can create a great evening feel, dim the lights for the perfect romantic ambience!